Personal Court Reporters is now part of Veritext! Personal Court Reporters has joined Veritext Legal Solutions, the national leader in court reporting. The Personal staff and reporters you have come to love doing business with will continue to serve you with the same stellar service that you have come to expect. Under the Veritext umbrella, we’re looking forward to bringing you many additional new technology tools, such as paperless exhibit sharing, and scheduling from your mobile phone including Snap Scheduling – where you can simply take a photo of the notice and text it in to schedule a deposition. Welcome to Personal Court Reporters, Inc.! Personal Court Reporters is a minority owned, full-service court reporting agency located in Southern California. We have been proudly serving the California legal community for nearly 25 years. We are WMBE certified as the only Native American/Woman-owned court reporting agency in California. PCR specializes in a wide array of services, including: real-time reporting, video conferencing, legal videography, jury focus groups, and much more. We have the privilege of working with many of the top law firms in Southern California. Our fully staffed offices span throughout Southern California, including Van Nuys, Downtown Los Angeles, San Bernardino, Ventura, Santa Ana, West Los Angeles, Ontario, and Santa Barbara. Want to view and download your transcripts and exhibits? Our court reporters are quality minded and experienced in complex litigation, trials and Workers’ Compensation cases. Our professional team of videographers utilizes state-of-the-art recording technology to record and synchronize your videos ensuring quality products. 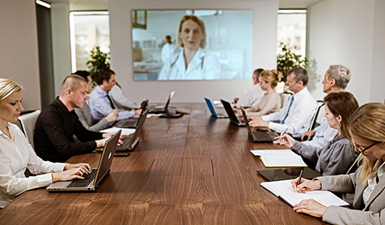 PCR offers superior video conferencing services to connect individuals without the stress and expenses that come with travelling long distances. We provide you with the best-suited team of reporters and professional staff to ensure seamless scheduling, photocopying, billing and transcript handling.